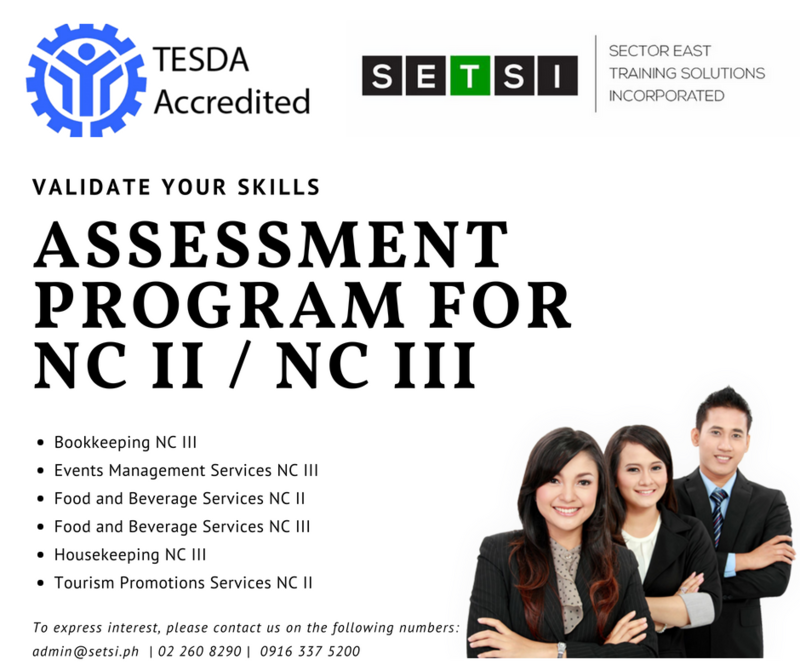 Sector East Training Solutions Inc. (SETSI) is a TESDA Accredited Competency-based Assessment Center located in Marikina City. "TESDA pursues the assessment and certification of the competencies of the middle-level skilled workers through Philippine TVET Competency Assessment and Certification System (PTCACS). The assessment process seeks to determine whether the graduate or worker can perform to the standards expected in the workplace based on the defined competency standards. Certification is provided to those who meets the competency standards. This ensures the productivity, quality and global competitiveness of the middle-level workers. TESDA has a Registry of Certified Workers which provides information on the pool of certified workers for certain occupations nationwide."